A solar water heater system from Florida Energy Water & Air can help you “go green” and save serious money. No matter where you live in Central Florida, be it St. Petersburg, Tampa, Lakeland, or the Orlando area, Florida Energy Water & Air has an office near you that is staffed by individuals who are extraordinarily well-versed in solar water heater technology. 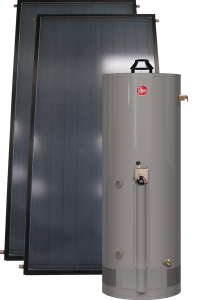 We carry a variety of solar water heaters made by Rheem, meaning you are certain to be able to find a model that perfectly suits your budget and your family’s water usage needs. Heating your water with a dedicated solar water heater instead of conventional electricity has a number of inherent benefits. First, it’s natural. Solar water heaters harness the abundant energy of the sun and require little to no electricity to deliver naturally heated water wherever it is needed in the home. Thus, using a solar water heater will lessen your family’s dependence on polluting fossil fuels. Second, Rheem solar water heaters have been proven to last longer than conventional water heating units, which typically have a lifespan of only about 10 years. This means that you and your family will be able to enjoy naturally heated water year after year without having to replace your water heater system nearly as frequently. Third, the federal government and many utility companies in Florida offer a variety of financial incentives to those who choose to have a solar water heater system installed in their homes, such as tax rebates and energy bill credits. To learn more solar water heaters and their ability to help you save money and be kinder to the environment, contact Florida Energy Water & Air today. We serve Orlando, Tampa, Sarasota, and other nearby areas of Central Florida. In addition to solar water heaters, we carry solar pool heaters, air conditioning units, attic insulation, walk in bathtubs, RainSoft air purifier and water purifier systems, and more.